Today my good friend told me that she was about to give up on her run the other day and was literally in her car about to drive home when she thought of me. She said she knew I would tell her to push further, so she got back out there and kept running. HOW AWESOME! That is so wonderful to hear. 2. New Green Monster Lovers! 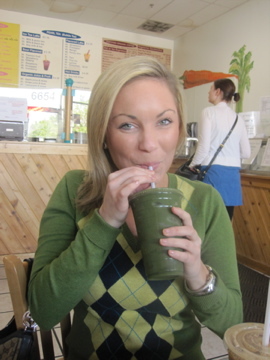 Not only did my friend Jillian love her first Green Monster smoothie this week, but today at lunch two other friends got a taste of their first green smoothie. 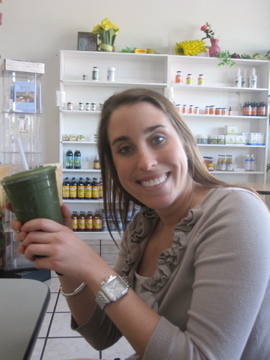 Maggie ordered the “Miracle Green: mango, orange, banana, and organic miracle greens” from OR Juice & Smoothie. Both she and Molly loved it! I get so excited when people love the healthy foods I eat. 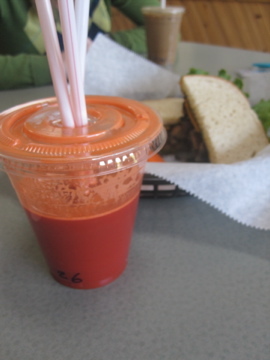 It was a stroke of luck that on the same Friday my brother had other plans for lunch, my girlfriends invited me to lunch at the one organic cafe that my brother doesn’t like. I was tempted to get the veggie sandwich or pita pizza that I know I like, but instead I tried something new! 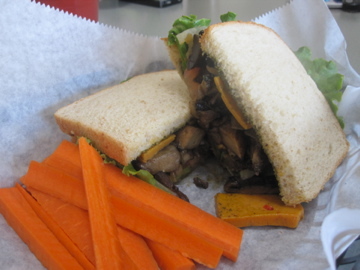 I got the “Portabella Sandwich: sautéed portabella mushroom, onions, red bell, yellow squash, melted vegan organic cheese, LTO, and pesto mayo served on a delicious John Dough bread.” I got it without mayo and on multigrain bread instead. It was incredible! 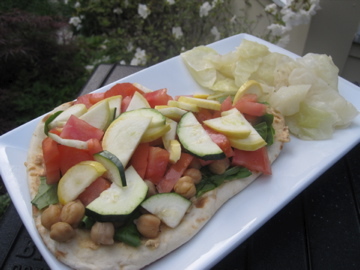 I loved the vegan cheese and the veggies were sauteed perfectly. My “I’ve met them in person” friends have been so supportive and caring about the breakup, and now all of you guys are leaving me the sweetest comments ever on that last post. I seriously cannot believe how wonderful the blogging community is. Thank you so much – your words mean more than you know. 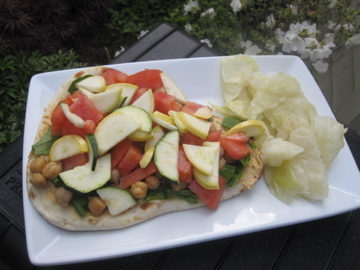 I didn’t get the pita pizza at lunch, so I decided to make my own for dinner! 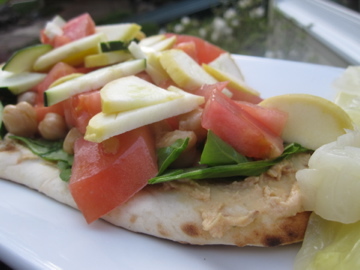 I started with a base of Trader Joe’s frozen naan and topped it with hummus, spinach, chick peas, tomato, and squash. It completely fell apart but the flavors hit the spot. TJ’s naan is just so good!! On the side I had some leftover sauteed cabbage. I’m pretty sure this is from St. Patrick’s Day and was frozen until now. Still tasted good. 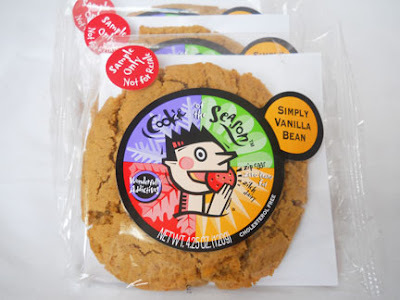 I don’t actually celebrate Tina’s holiday (I eat cookies ALL the time), but tonight I treated myself to an Alternative Baking Company Simply Vanilla Bean cookie. It wasn’t quite as good as the chocolate chip I had a little while ago, but these cookies are still bomb. What is making you happy lately?? I am happy about a lot of things lately and it just shows the difference a few months can make as I had a terrible January! So lovely post! :) What makes me happy? Well, nice sunny weather, my friends and family, fresh spring produce, an extreme amount of apples eating every day:) and the end of school semester coming! That’s so cool how you inspired your friend to keep running! And I love the Alternative Baking Company’s cookies! I think lately, the fact that it’s almost summer is making me happy! Love and new hope in life’s possibilities are making me happy. Love this post! I got my parents to try Green Monsters, and now they’re hooked! School ending yesterday makes me happy! I can’t believe I haven’t gone to OR Juice and Smoothie! That is now on my list of things to do over the summer. My college bookstore sells ABC cookies cheaper than anywhere I’ve seen, so I always stock up there. My favorite is the peanut butter cookie with chocolate chips. My boyfriend and I just made pizza on naan last night for dinner— so good! Do you know what just made ME so happy????!!! The fact that I now know where I can get green juice and smoothies in STL!! I KNEW there had to be a place, but had never come across one. In my 2 1/2 years of coming to STL at least once a month for drs and treatments I have never come across a place to get my greens! I really am so happy to know where to go, and even HAPPIER that it is located in CWE, which is our stomping grounds because of Siteman/WashU/Barnes. You have seriously made my day. If I had known this yesterday when we were there, I would totally have gone and got something yummy:-) Thank you for the great info! AHH! I love all these things too! It totally makes my day when people think healthy food would be gross and then they try it and fall in love! !